BOB SCHIEFFER: Good evening from the campus of Lynn University here in Boca Raton, Florida. 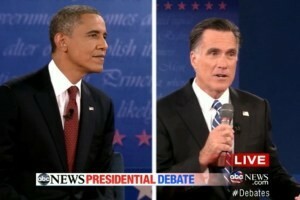 This is the fourth and last debate of the 2012 campaign . . .
MITT ROMNEY: I hope to heck to make you proud, Pop. BARACK OBAMA: What I wouldn't give for a smoke. BS: . . . Was it an intelligence failure? Was it a policy failure? Was there an attempt to mislead people about what really happened? MR: We see in—in—in Libya an attack apparently by—well, I think we know now by terrorists of some kind. BO: A cigarette and a glass of White House honey ale. BO: That’s not true. Even an e-cigarette. BO: No, but what I— I'd really like to get away from all this. Grow a beard. BO: Here—here is—here is— Take up singing more seriously. MR: And I concurred in that. . . . That was something I concurred with. BO: Governor— Get the Traveling Wilburys back together and tour with them. BO: Yes, the Wilburys, definitely. With special guest Beyonce. BS: Governor Romney, I would just ask you, would you have stuck with Mubarak? MR: No, I believe, as the president indicated and said at the time, that I supported his—his action there. I felt that—I wish we’d have had a better vision of the future. Oh, fudge. Maybe it's just not our time yet. Maybe the world's not ready for a Mormon president. MR: Let me—let me step back and talk about what I think our mission has to be in the Middle East, and even more broadly, because our purpose is to make sure the world is more—is peaceful. We want a peaceful planet. See, we're not so scary. And no, I am not wearing holy underwear. MR: But for us to be able to promote those principles of peace requires us to be strong, and that begins with a strong economy here at home, and unfortunately, the economy is not stronger. When the—when the—the president of Iraq—excuse me—of Iran, Ahmadinejad—Darn it all!—says that our debt makes us not a great country, that’s a frightening thing. MR: And finally, we have to stand by our principles . . .
BO: America remains the one indispensable nation. And the world needs a strong America. And it is stronger now than when I came into office. Now, Governor Romney has taken a different approach throughout this campaign. You know, both at home and abroad, he has proposed wrong and reckless policies. BS: Governor Romney, wrong and reckless policies? MR: [Chuckles] I’ve got a policy for the future and agenda for the future. One word: Tagg. BS: Let me get back to foreign policy. MR: Well, I need to speak a moment if you’ll let me, Bob— Polite but firm. BO: Ten years earlier— Giants up 6-0! BO: But that was ten years before you took office. MR: And we—absolutely. Whoa, Nellie. BS: What if, Governor—what if the prime minister of Israel called you on the phone and said: Our bombers are on the way. We’re going to bomb Iran. What do you say? MR: Remember: presidential. Bob, let’s not go into hypotheticals of that nature. Our relationship with Israel, my relationship with the prime minister of Israel is such that we would not get a call saying our bombers are on the way or their fighters are on the way. This is the kind of thing that would have been discussed and thoroughly evaluated well before that kind of action. BO: Maybe my next book should be a thriller . . .
MR: Yes, but let me—let me—let me come back— let’s come back— H-E-DOUBLE HOCKEY STICKS! BO: Set in the Middle East, of course. MR: I mean, the president received a letter from 38 Democrat senators saying the tensions with Israel were a real problem. Now, that's more like it. BO: No. Or there's Michelle's idea. MR: They asked him, please repair the tension—Democrat senators—please repair the damage in his—in his own party. Give him heck, Mitty! BO: No. A line of organic products. MR: You’re wrong. You’re wrong, Mr. President. There's a left hook for you. BO: I—no, I am not wrong. Obama Oatios. Malia's Malted Milk Balls. MR: You’re wrong. Don't take his guff! MR: People can look it up. You’re right. What the flagpole . . . ? BO: People will look it up. MR: Look, I—I love to—I love teachers, and I’m happy to have states and communities that want to hire teachers, do that. I—by the way, I don’t like to have the federal government start pushing its way deeper and deeper into—into our schools. Let the states and localities do that. I was a governor. The federal government didn’t hire our teachers. BO: Calling W . . .
MR: But I love teachers. But I want to get our private sector growing, and I know how to do it. BS: I think we all love teachers. [Laughter] Gentlemen, thank you so much for a very vigorous debate. We have come to the end. BS: Er, as I always do at the end of these debates, I leave you with the words of my mom who said, go vote. It makes you feel big and strong.